From the 1840s to the 1860s, Peru enjoyed a period of stability under the presidency of Ramón Castilla, through increased state revenues from guano exports. However, by the 1870s, these resources had been depleted, the country was heavily indebted, and political in-fighting was again on the rise. Peru embarked on a railroad-building program that helped but also bankrupted the country. In 1879, Peru entered the War of the Pacific which lasted until 1884. Bolivia invoked its alliance with Peru against Chile. 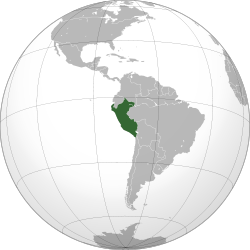 The Peruvian Government tried to mediate the dispute by sending a diplomatic team to negotiate with the Chilean government, but the committee concluded that war was inevitable. Chile declared war on 5 April 1879. Almost five years of war ended with the loss of the department of Tarapacá and the provinces of Tacna and Arica, in the Atacama region. Two outstanding military leaders throughout the war were Francisco Bolognesi and Miguel Grau. 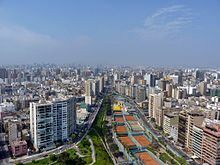 Originally Chile committed to a referendum for the cities of Arica and Tacna to be held years later, in order to self determine their national affiliation. However, Chile refused to apply the Treaty, and neither of the countries could determine the statutory framework. After the War of the Pacific, an extraordinary effort of rebuilding began. The government started to initiate a number of social and economic reforms in order to recover from the damage of the war. Political stability was achieved only in the early 1900s. Peru engaged in a brief successful conflict with Ecuador in the Paquisha War as a result of territorial dispute between the two countries. After the country experienced chronic inflation, the Peruvian currency, the sol, was replaced by the Inti in mid-1985, which itself was replaced by the nuevo sol in July 1991, at which time the new sol had a cumulative value of one billion old soles. The per capita annual income of Peruvians fell to $720 (below the level of 1960) and Peru's GDP dropped 20% at which national reserves were a negative $900 million. The economic turbulence of the time acerbated social tensions in Peru and partly contributed to the rise of violent rebel rural insurgent movements, like Sendero Luminoso (Shining Path) and MRTA, which caused great havoc throughout the country. Concerned about the economy, the increasing terrorist threat from Sendero Luminoso and MRTA, and allegations of official corruption, Alberto Fujimori assumed presidency in 1990. Fujimori implemented drastic measures that caused inflation to drop from 7,650% in 1990 to 139% in 1991. Faced with opposition to his reform efforts, Fujimori dissolved Congress in the auto-golpe ("self-coup") of 5 April 1992. He then revised the constitution; called new congressional elections; and implemented substantial economic reform, including privatization of numerous state-owned companies, creation of an investment-friendly climate, and sound management of the economy. Fujimori's administration was dogged by insurgent groups, most notably the Sendero Luminoso, who carried out terrorist campaigns across the country throughout the 1980s and 1990s. Fujimori cracked down on the insurgents and was successful in largely quelling them by the late 1990s, but the fight was marred by atrocities committed by both the Peruvian security forces and the insurgents: the Barrios Altos massacre and La Cantuta massacre by Government paramilitary groups, and the bombings of Tarata and Frecuencia Latina by Sendero Luminoso. Those incidents subsequently came to symbolize the human rights violations committed in the last years of violence. During early 1995, once again Peru and Ecuador clashed in the Cenepa War, but in 1998 the governments of both nations signed a peace treaty that clearly demarcated the international boundary between them. In November 2000, Fujimori resigned from office and went into a self-imposed exile, avoiding prosecution for human rights violations and corruption charges by the new Peruvian authorities. Since the end of the Fujimori regime, Peru has tried to fight corruption while sustaining economic growth. 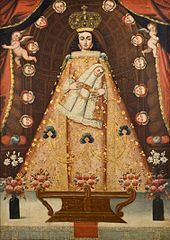 In spite of human rights progress since the time of insurgency, many problems are still visible and show the continued marginalization of those who suffered through the violence of the Peruvian conflict. The combination of tropical latitude, mountain ranges, topography variations, and two ocean currents (Humboldt and El Niño) gives Peru a large diversity of climates. The coastal region has moderate temperatures, low precipitations, and high humidity, except for its warmer, wetter northern reaches. In the mountain region, rain is frequent in summer, and temperature and humidity diminish with altitude up to the frozen peaks of the Andes. The Peruvian Amazon is characterized by heavy rainfall and high temperatures, except for its southernmost part, which has cold winters and seasonal rainfall. Because of its varied geography and climate, Peru has a high biodiversity with 21,462 species of plants and animals reported as of 2003, 5,855 of them endemic. 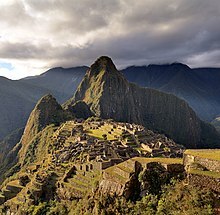 According to a 2015 genealogical DNA testing, the average Peruvian is estimated to be 79.1% Native American, 19.8% European, and 1.1% Sub-Saharan African overall. According to the Peruvian Constitution of 1993, Peru's official languages are Spanish and Quechua, Aymara and other indigenous languages in areas where they predominate. Spanish is spoken by 84.1% of the population and Quechua by 13%, Aymara by 1.7% while other languages make up the remaining 1.2%.